Egypt’s Court of Cassation upheld on Monday a three year sentence against ousted Islamist president Mohamed Morsi and 19 others and issued fines for five others for insulting the judiciary. The court rejected today the appeal by Morsi and 24 others, including Islamists and non-Islamists, against a 2017 court ruling, which convicted them of insulting the judiciary and criticising court rulings. In December 2017, a Cairo criminal court sentenced the defendants to three years for insulting the judiciary and its judges through publications and statements to TV and radio stations, as well as social media. Those sentenced include jailed members of the banned-Muslim Brotherhood figures Saad El-Katatny, Mohamed El-Beltagy, and Sobhi Saleh, who were present today in court. Some of those sentenced are fugitives or had been released pending the appeal. Political Activist Mostafa El-Nagar and journalist Abdel-Halim Kandil were among those sentenced to three years in prison today. The five defendants in the case who were fined EGP 30,000 include controversial TV presenter Tawfik Okasha, political analyst Amr Hamzawy; political activist Alaa Abdel-Fattah; prominent rights layer Amir Salem; and former Wafd Party MP Mahmoud El-Sakka. The court ruled that all defendants in the case, with the exception of Okasha and El-Sakka, are to pay EGP 1 million in compensation to the judges club; a total of EGP 23 million. 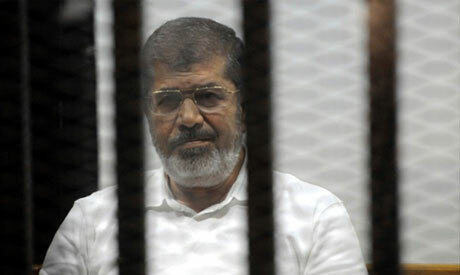 Morsi will also pay another EGP 1 million in compensation to another judge.